It is? Which bank do ya'll work for?! who's riding where Monday and who will let me ride their bike? I rode this Monday, and you can ride my KDX. Except I'm about 3 hours North and have no big water... unless somebody gets a thing going South of me. Definitely not a day off for the University of No Holidays. It's just a holiday for Americans. *Full disclosure- not this American, because he scheduled work anyway, not being a big believer in "Presidents". I don't believe in Santa Claus, but I'll still take Christmas off if my employer gives it to me. Your boss must be a real hardass. Well, if you had to work for your hardass boss yesterday, you missed a perfect day on the ice! Temps were low. but no wind and a nice warm fire plus a great group of riders made for a really good time. 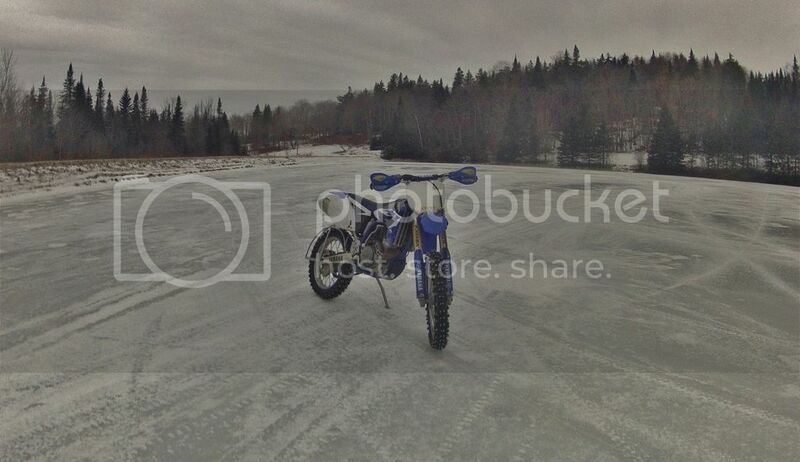 Not to mention getting to try out my new bike on the ice for the first time on newly done suspenders. Woot! Good times. ..a nice warm fire plus a great group of riders made for a really good time.. I need to score myself an invite to this spot someday. Just show up as my +1. I'm bummed I missed yesterday. Hopefully I get another chance this season. Looked awesome. Super Tuesday BUMP! Gonna be cold all week. I vote we get together and shred some ice! Will loan bikes in trade for central-ish spot to ride . Was it one of you guys out on the Hoit Road Marsh on Sunday? I waved to someone there with a KX as I was out putting around on the Shadow. It looked pretty mushy that's for sure. If it is enough, I'm in. Yeah, I could go for one more ride this season. I noticed that last Friday there were still fishing huts on the pond next to the Brattleboro retreat. Doug, is there rideable ice all the way north where you are, right now? We'll be riding on Sunday on Lake Iroquois. Likely the last ride of the season but the ice was great last weekend and we've had a good run of cold and sunny weather. I'm betting it'll be fantastic. Can't wait for Sunday. I'll be riding and grill master! Is the track/parking near the boat launch off of Beebe Ln? It's the beach access off of Beebe Lane. Continue past the turn off to the boat launch and you can't miss the beach. Hmm. Why do you ask?